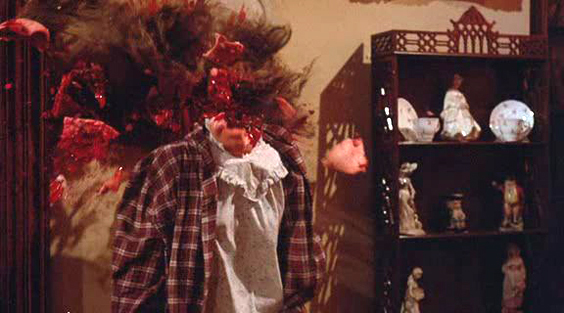 Not many movies have gone through the production hell that Wes Craven’s “Deadly Friend” faced. Ordered by Warner Bros. to add in extra gore and a brand new “shocking” ending, the finished film is a favorite of some fans while others cry out to see the original vision that Craven had in mind. While the final film may be a bit hit-or-miss, one thing is certain that everyone is sure to love. The death scene of nosy neighbor Elvira as she gets pummeled in the head with a basketball as her lifeless torso hits the ground spewing blood everywhere. It’s a hilariously gratuitous gore scene in the middle of a fairly serious horror drama. This movie is all sorts of weird and this death scene is just about the tip of the strangeness. I can’t say this death really fits in with the rest of the movie but at least it’s fun.